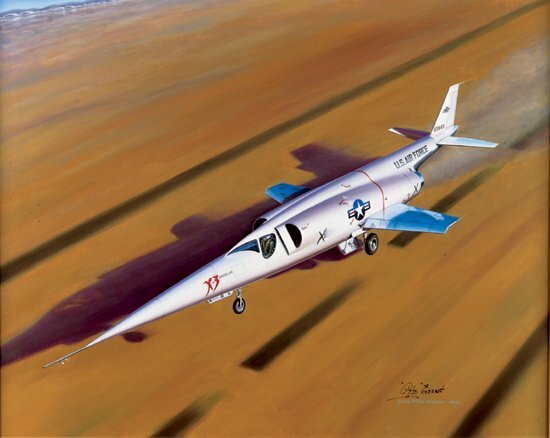 Image Size: 24.5" x 23.75"
Paper Size: 29" x 25.5"
Perhaps the most visually stunning of the "X" planes, the Douglas X-3 Stiletto looked like Mach 2 just sitting on the ramp. Flown on three of its six USAF test flights by veteran test pilot Lt. Col. Frank K. "Pete" Everest, Jr., the X-3 was said to be the most difficult flying aircraft encountered by the test pilots who flew it. The stubby-winged "Stiletto" required a 3 mile takeoff run to get airborne, and this with full flaps! Personally autographed by Brig. Gen. Frank K. "Pete" Everest, Jr.